So you're wondering what to wear? You might have seen photos of other people's costumes from previous years. You'll might be worried about the complexity and probable expense of getting one. But don't worry - many of the pictures you'll find on the Web are of sophisticated costumes created by devoted carnival fans, who spend months designing and creating them. Others are theatrical costumes that have been hired for a day. Not everyone goes to such lengths, especially if it's only their first or second visit. The amount of time and money people spend on costumes varies widely, so just use the photos to get a flavour of the atmosphere and some ideas for a costume. Do you want to taste the carnival atmosphere by wearing a costume for an hour or two? Do you want to spend several hours or even days in costume? Do you need a costume for a specific event? Do you want to buy it or rent it? All of these questions will help to narrow down your options. 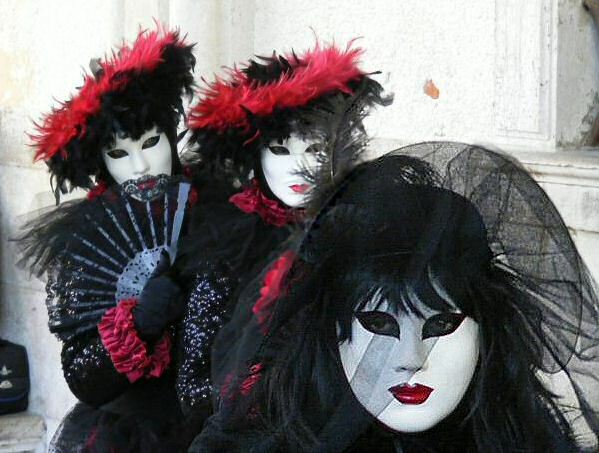 The cheapest and simplest costume (around €70 or less) is a mask and cloak, perhaps with some accessories - all of which are widely available to buy in Venice. If you prefer something more elegant, you can hire beautiful historical period costumes for upwards of around €250 - read on to find out where. If you want to buy a historical costume (instead of renting), you're probably looking at €1000 plus and you'll need someone with the time and experience to make it. Visiting outside carnival time? There are still opportunities to get dressed up, such as an organised walk and photo shoot* that includes costume hire. Just like any other formal attire, it's a good idea to make sure that the costume looks good on you. These are not "one size fits all" costumes, so you will want to arrange an appointment to try it on, see how well it fits, and check if it's comfortable to move around in. You can often reserve a costume in advance and swap it for another if you're not happy after trying it - some suppliers keep spare costumes just for this purpose. Some suppliers (but not all) will adjust the costume to fit as part of the price, so that you're more likely to get the original costume you chose. But it's best to do as much research and preparation as you can beforehand, because suppliers get very busy as the carnival season approaches. Many costumes will include essential accessories, such as matching jackets and hooped underskirts. Some will include other accessories such as hats and bags. You should check what is included before buying extras, but there is usually room to add accessories to your own taste. We don't have a recommended costume supplier, but Atelier Pietro Longhi have previously been mentioned by the carnival organisers and they have an online catalogue. Atelier Tiepolo and TragiComica are other costumers and they have been around for a long time. You can also ask your event organiser or hotel for their preferred supplier. Another option is to bring a costume with you. You will have more time to browse, and will arrive in Venice ready to enjoy the atmosphere straight away. 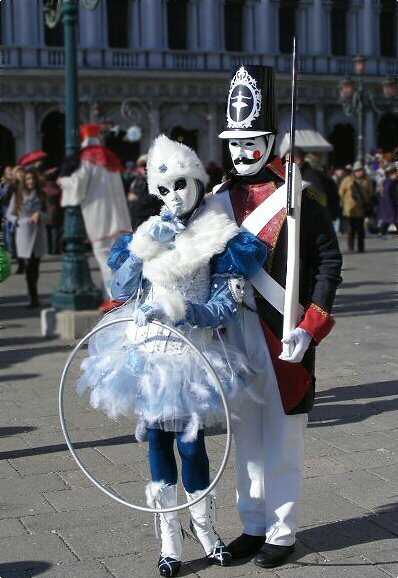 However, you will need to have a clear idea of what costume you want, because your supplier may not be familiar with the Venice carnival. Party stores - which often sell mass-produced costumes - are probably OK if you just want to spend a few hours in costume. Otherwise, you'll need to find a specialist who can supply a well-fitting costume that will last several days and help to keep you warm. You could hire a costume and bring it with you. Professional costume hire suppliers are often run by people who make the costumes themselves, or have close links with the costume makers. They are often passionate about how their costumes look. A good supplier will allow you to try on various costumes before you spend any money, and give an honest opinion on whether they look good on you. Finding these suppliers can be tricky, but not impossible. In some countries, there is a professional association for costume hire shops, and they will know which members are closest to you. Your local amateur dramatic or operatic society may be able to give you some pointers, since they might rent costumes for their productions from a local supplier. Professional theatre and dance companies tend to have their own in-house costume departments instead, but sometimes they rent their costumes to the public or sell them after a production has finished. This seems to be fairly unusual, but it might be worth a try. If you're planning to attend a formal event, such as a ball, check the dress code first. If a period or historical costume is needed, then the best people to supply one are usually the suppliers in Venice who have been doing so for years. Some events have a less strict dress code, and at a few you'll be OK even in modern formal attire as long as you wear a mask. To be sure, it's best to check with the event organiser. You'll want to a mask to go with your costume. We added some individuality by making our own masks, and this is ideal if you've got a flair for creativity. If not, then masks are widely available to buy in Venice, are well made, often low cost, and sometimes better than the ones back home. If you're short of time, this may be one purchase that you can leave until you arrive in Venice. The quality of the mask is important. In the cold air, condensation tends to settle on the inside of your mask, particularly if it's one that covers your whole face. A cheap mask may start to fall apart with the moisture; so buy a good quality mask and you'll be able to use it for a while, then keep it as a souvenir afterwards. If you'd prefer something unique, you could even create your own at a traditional mask-making workshop* in Venice - you can find these on event websites such as Viator*. If you're mingling with the crowds, it's common practice to cover your head as well as your face, so you need to think about some kind of hat. You might also need some material to wrap around your face, to cover the gap between hat and mask. Long curly wigs or feather boas are a simple solution. Alternatively some voile material or fake fur can come in very handy, and most fabric shops at home will have suitable material that you can cut to the right size. Safety pins and hair grips can keep everything attached together. If you're just planning on going to and from a ball, rather than mingling with the crowds, you might not worry so much about headgear - it could make you too hot once you get indoors. How much time and money should I spend? It varies widely. Some people spend weeks or months making their own costume, and it shows. Others hire period costumes and spend money on accessories to turn them into carnival outfits. But in the end, it's carnival time, and the only thing people are bothered about is having a good time - so it's really a personal choice as to how much time and money you spend. Plenty of people visit Venice without any kind of costume at all, so even a mask costing a few euros can set you apart from the crowd.